WØEA Blog! : A spot of SPACE! I was happy to find some goodies in my mailbox when I got home from work today: a nice personal QSL card from KG6EYC, Frank, and my new (to me) ELK dual band log periodic antenna. 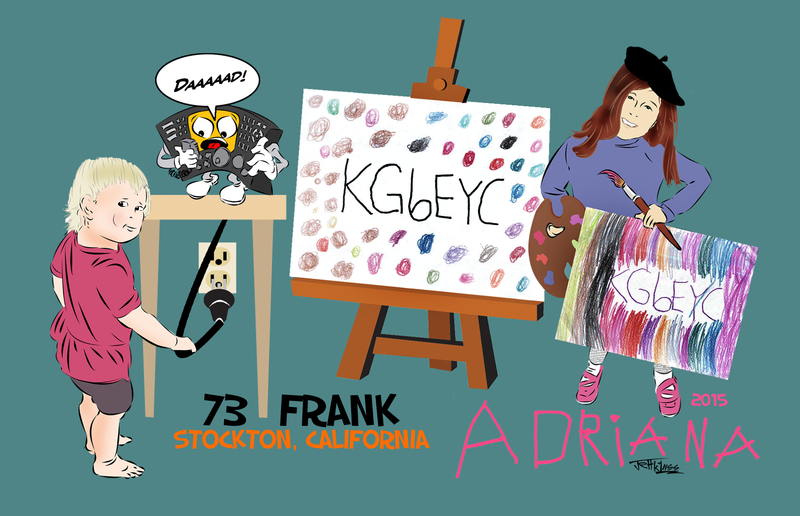 Frank's QSL is one of K1NSS's special creations, a personalized piece of art. Frank's card features his two daughters and some of their art work. Very cool! The coolest part of receiving this card though was that it was our first CW contact. Frank isn't so much a newbie at CW but he's still learning. He's completed the CWOps Academy and it shows, he's got a good pace going. Just a few more months and he'll be eligible to join the club I'm sure. It's always nice to know someone as interested in CW as he is and at his age. Best of luck Frank! Also check out his blog at http://vadept.com/. As far as the Elk goes, I unpacked it up in the office in my apartment and as soon as I figured out how it all gets together, I got a text on my phone alerting me that there was an SO-50 pass in just 10 minutes. I had planned on being able to make it but everything seemed to fall out of sync so I was not prepared. I quickly grabbed everything off the desk I'd need: 817, voice recorder, mic, bag, coax and antenna. I ran up the 4 flights of stairs and got myself situated on the roof of the parking garage just as the satellite peaked over the horizon. 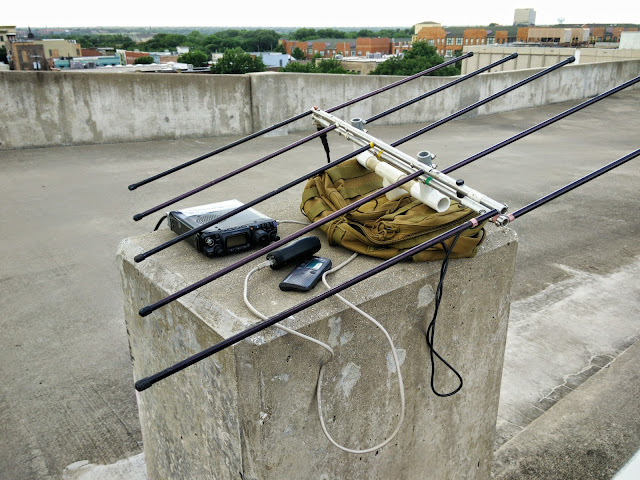 I started getting the radio set up for the cross band split and sure enough, with some pointing, I could hear a bit of activity on the satellite, but for some reason I had insane SWR when I transmitted. I had tested the antenna briefly in the shack and everything seemed in order so I couldn't figure it out. I fiddled with it through the whole pass and didn't have any luck. As the satellite passed below the horizon, I reassessed the situation and checked on the next pass. SO-50 wasn't due for another day and the next one was FO-29, one of the linear transponder sats, in about 20 minutes. So I sat for the next 15 minutes until FO-29 came up. The pass was a decent one with about a 35 degree max elevation. I have not had a ton of luck working the linear sats half-duplex but it was worth a shot. There was a strong QSO going on in the upper part of the passband but I stuck right in the center and called a few times. The thing about these sats is that you can never be quite sure where you're coming out on the other end so I have to tune around a lot to find the person calling me. About 8 minutes into the 15 minute pass, I finally heard my call coming back to me from that familiar voice of Wyatt, AC0RA, back up in Cedar Rapids. I have worked Wyatt a few times on the satellites when I was in Iowa so he also recognized my call. I had one under my belt! I kept tuning around and calling but I was unable to stir up any more activity. I followed the strong QSO a while and I heard a 6 station calling towards the end of the pass but didn't have the brains to figure out where I needed to tune my transmitter to get close to his signal. Maybe in time I'll get there! So if you're on the birds, keep an ear out for my little signal from EM13 and chase me around the band, transmit fixed.